UK hackers linked to the Anonymous group are encouraging supporters to attack the Home Office website this Saturday (7 April) in protest at the extradition of three UK citizens to the US. Called #OpTrialAtHome, the hacktivist group @AnonOpUK posted a warning on its Twitter page that an attack on the Home Office was planned for Saturday, 7 April. 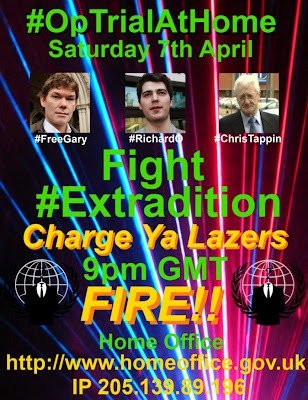 An associated photo/poster shows images of Gary McKinnon, Richard O’Dwyer and Christopher Tappin. McKinnon and O’Dwyer are awaiting extradition from the UK to the US. Tappin’s extradition was effected on 24 February when he was flown to El Paso, Texas. Supporters have been encouraged to launch denial-of-service attacks on the Home Office's IP address, which Anonymous has revealed. Those not savvy enough to launch automated attacks on the site could contribute to the effect by simply visiting the site in large numbers. Julian Assange, the editor-in-chief and founder of WikiLeaks, was arrested in the UK under an EAW issued by Sweden, and is currently fighting extradition to Sweden. McKinnon, a Scottish systems administrator, was arrested in 2002 for allegedly hacking into US military and Nasa computers in 2001 and 2002 and deleting files and copying data. Tappin, a retired British businessman, is accused by the US government of illegally exporting materials to Iran for building surface-to-air missiles. O'Dwyer, the owner of TVShack.net, is charged with hosting copyrighted materials on his site and the US Justice Department has been seeking his extradition since May 2011. Anonymous’ #OpTrialAtHome is timed to commence at 9:00pm on Saturday, April 7, with a DDoS attack on the Home Office website.